Dying eggs and making Easter bonnets are great craft activities for friends and family during the spring. You can get as traditional or as creative as you want when creating bonnets and eggs. 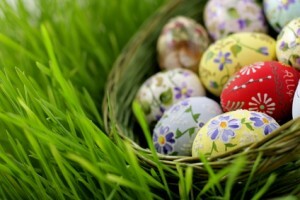 Even if you don't celebrate Easter taking part in the crafts associated with the holiday can be a lot of fun. These two craft projects are a great way to bond and have fun with friends and family. During the holiday season one fun craft project you can try is to make your own Christmas Ornaments. If your family does not celebrate Christmas, but a different holiday season you can still have a lot of fun making these crafts. These projects can also make excellent gifts for your parents. As Autumn approaches and the leaves begin to fall off the trees, we start to think about fun fall crafts. Leaf art is a great fall activity, but you don't have to wait for the leaves to fall off the trees to make some leaf art. Below you will read about how to create a leaf print book. To make a little book like this, you will be able to combine a few different types of leaf crafts. A great way to introduce your kids to a new campground or camping area. Take a family trip through nature when you go on this self-designed scavenger hunt. First, make up a list of things you want to look for. Then, head out on a nature hike and have each person check off the items they see. If you'd rather (if you're hiking with smaller kids), search as a team and point out what you see so everyone can take a look. If you have more than one kid in the car, have one child close their eyes and put out their hand. The other child uses their finger to trace a letter on the palm of the out-turned hand. Try to guess the letter, then trade places. If the kids are good at guessing, they can try spelling out whole words. This classic game is a staple of all road trips, and it has a few variations. The easiest version is to ask kids to look for letters of the alphabet, one letter at a time. They can get the letters from road signs, billboards, and, of course, license plates. When someone finds “A,” everyone moves on to “B” and so forth. License plates come in handy for tricky letters like Q, X, and Z! This game requires three players and some open space. One player is designated as the Artist, one as the Model, and one as the Clay. The artist should close their eyes (or blindfold themselves with a bandana). The Model then strikes a pose, something that puts their body in an unusual shape. "Throw me something mister" - this is one of the first phrases kids in New Orleans learn to say. Everyone loves a parade and Mardi Gras season hosts dozens of parades both large and opulent to small and down home. Even if you can't make it to a Mardi Gras parade you can join in the festivities by hosting a party and making some fun and festive Mardi Gras decorations. Oh, and don't forget the King Cake - click here for the recipe. Apple and Potato stamps are an easy way to have fun and create some beautiful art. This project requires relatively few supplies, but will require supervision for younger children. Start by washing your potatoes and apples well. The first part of this project is the creation of the stamps, which requires the use of a sharp knife. It is important for younger children to be well supervised at this point, it may even be a good idea for an adult to do the steps that involve using a knife. Step one is to cut the apples and potatoes in half. Make sure the cuts are nice and clean, as any mistakes will be apparent when the apple and potato halves are used as stamps. At this point you can leave the apples halves whole and use them just as apple shaped stamps. You can also use the halves to create more complex stamps. In order to create a more complex stamp, you start by drawing the outline of the shape into the center of the apple or potato half. Once the outline is clearly drawn in, use the knife to cut the outline into the apple or potato, the cut should be about a quarter of an inch deep. After the outline is cut, carefully carve away the outer edge of the apple or potato away from the outline cut. Make these cuts from the outside in, until you reach the cut of the outline. You will want to cut away about a quarter inch of the apple or potato, leaving just the shape that you drew into the apple or potato as a stamp. When your stamp is made, pour a small layer of paint into a plate. Spread the paint throughout the base of the plate. You can dip the stamp or apple half into the layer of paint, or you can use a paint brush to apply the paint to the stamp. Then, place the stamp paint side down onto the object you are decorating. You can use these stamps to decorate clothing, create pictures or anything else that could use some decoration and absorbs paint. When you are planning your project, make sure that you decide what type of object you want to decorate and also make sure you have the correct type of paint for that object. Tie Dying is a great way to spend a day. You have the opportunity to be creative and create a truly unique piece of art. Even better than having a one of a kind piece of art, this is a piece of art that you can wear. When you are preparing to tie dye, you first have to choose what you want to create. You can make t-shirts, handkerchiefs, sheets, pillow cases and more. Learn How to Make Sugared Flowers - Yes you can eat them! Summertime is a great opportunity to practice some new flower crafts. It's amazing how many different crafts use fresh flowers. You can press flowers, but if you have access to edible flowers, you can enjoy a much sweeter flower craft. Sugaring flowers is a simple, delicious, and fun way to preserve and enjoy edible flowers. Once you have perfected your skills, you can use them to decorate delicious cakes and other food items. If you want to help your child keep on camping, check out the national organizations listed below. They'll have plenty of tips for ways you and your kids can get involved. American Camping Association - The website will help you find an ACA-certified residential or day camp. Girl Scouts of the USA - Information on the Girl Scouting movement. Boy Scouts of America - Program information and resources for youth members and Scouts. Camp Fire USA - A non-profit youth organization focused on building self-esteem, character development, leadership skills, and social responsibility. NOLS - National Outdoor Leadership School - the only school that focuses on wilderness skills, leadership, and environmental ethics. Outward Bound - A non-profit organization consisting of 5 wilderness schools and 2 urban centers offering adventure based, experiential education summer programs for teens. This is a great campfire game, or a fun thing to do during a day hike break.